It was a splendid morning on Saturday for our Under 9 team. 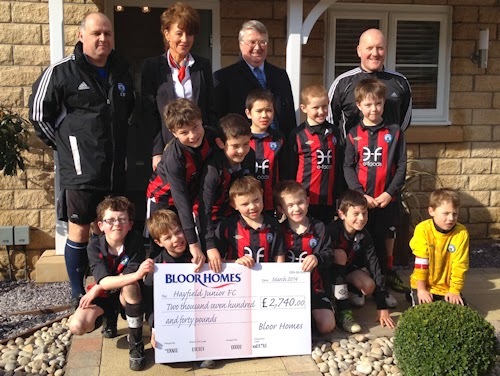 Following 2-0 and 5-4 victories over Mountfield Rovers Jets with goals from Will Shaw, Adam Hooper, Charlie Southern and James Ramsay, the team were presented with a cheque for £2,740 by Bloor Homes. The extremely generous donation was made as the club have allowed Bloor Homes to use our car park during the development at Mainwaring Gardens. This has allowed the Bloor's workforce to carry out the build with minimal inconvenience for our neighbours on Swallow House Lane. The donation will be used for further groundwork on Bank Vale this summer.